Aimee Ryan is returning for her second year as a staff writer and is a sophomore majoring in counseling and community psychology. NMSU has always been her choice of school even before she graduated from Cobre High School in Bayard, New Mexico in 2017. Her journey so far at NMSU has taught her so much and has exposed her to many opportunities within a short amount of time. She has found herself at home here at The Round Up and through NMSU’s Counseling and Educational Psychology department. Before NMSU, she was a high school cheerleader, a student council member, and an honors student. 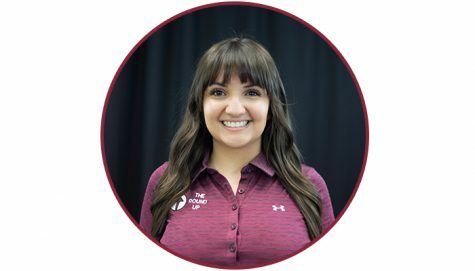 Aside from being a staff writer, she is the secretary of NMSU’s Counseling Undergraduate Society and has her eyes on becoming a school psychologist in the future. Ryan enjoys her job because she always learns something new about her school and loves the team she works with. Her favorites stories that she’s written include “NMSU students find newly-instilled pride in football team,” and “New Mexico State officially identifies two-finger pistol as school-spirit hand sign”. During her freshmen year, she mainly covered stories concerning student life. This year, she will be mainly covering stories involving news around the College of Education and the College of Engineering. Aside from her life as a student, Ryan enjoys being with her family, friends, and pets, being outdoors, traveling, reading, listening to music, and engaging in other hobbies.